Pulling my head out of my head. Miles Davis’ quartet is working How Deep is the Ocean a few feet away. I have an almost drained but still frosty glass of pilsner next to me on the window sill. There’s a slight breeze coming through the open window, 76 degrees, just a hint of humidity. My neighbor is roasting a chicken, smells like some tasty ‘taters and broccoli too.A cab pulls up to the stoplight downstairs, and I can year the Yankee game on his radio, there’s a pitch, a swing, and then the light changes and the game pulls away. I am just a teeny bit light-headed from the cold beer, the first I’ve had in days. This is the sort of moment I dreamt of in January, or in a too-long meeting, or in a middle seat to Godknowswheristan, this exact sort of moment — living is easy, all’s right with the world, summertime, deep sigh. But this moment is only here because I suddenly let it be, put down my book, closed my eyes, felt the breeze, smelled the chicken, heard the ball game. I hadn’t noticed ten breezes, ten chickens, ten cabs before this one, hadn’t heard Miles’ last ten tunes, hadn’t tasted the last ten sips of beer. And that’s the danger of living in my head, of not being here and now, of wishing for summer when summer is here, of missing her when she is in my arms — the voracious tyranny of imagination and distraction, of the mental life, of modern life, of mature life, of the whole parade passing by as I am busy making plans. Time to wake up and smell the chicken. Next Post Why it doesn’t look just like the picture. Quiet times are when our minds wander about. Then we awake, only to discover we are in the present, as it should be. Time to move on in a different time and place. This is great Danny. Feels like my entire life was like this. Always planning and never living. I know that for me, i spent years making illustrations and gallery work for clients or success that never came. All the while, the work of the journal and doing work from observation was calling me, quietly, persistently, to enter into a new head space. One that would both excite me and slow me down so I could be taught the value of every day. I gained this insight and this joy because of you. I know you hear it all the time, but thank you. You have given me back my life and helped me to appreciate the life that I am living. Thank you, too, Chris for sharing. Grateful for these words. Thank you for reminding us that summer is here now. Oh so true! What a great reminder to slow down and appreciate the here and now. Thank you. Danny is almost always ‘on the nose’, with his thoughts! We ARE here and now! Take care and stay well. so many thank yous for so many things, Danny. And, I’ll double your thank yous to Danny…for the encouragement to continue my art and to enjoy it each day…and to enjoy and participate in EACH DAY! Stay well. This here and now is perfect and complete just as it is, no gain, no loss. In the times when we are searching, grasping, what is it that needs to be different? If it’s this subtle itch of wrongness that we can’t define, we need to investigate, because I think we are creating it. I agree with you Danny., you communicate the essentials. 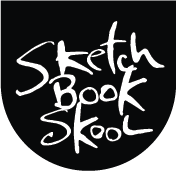 Sketchbook Skool,, plus your blog is a wonderful gift from you and I appreciate your work. You really put your finger on it with the feeling of missing something that is right there with you. I think it happens more and more as you get older. Well, as Confucius say, beer not tasted is beer that is wasted. Reminds me of a story Jon Kabat-Zinn tells, of a postcard he’d gotten from a friend. A picture of a spectacular European destination on the front. On the back, the inscription reads: “A wonderful time. Wish I was here.” Thanks for this one, Danny. Hoping the sheer ubiquity of the monkey business makes it possible to get back to the work that much quicker.